In our busy lives, we have to schedule important appointments, or they won’t get done. Are you putting yourself on your schedule and honoring that designated time? It’s important to do so. One of the most important things to schedule is restorative sleep. Your success hinges on getting enough restorative sleep so you function at your best. But what if sleep is on your schedule, but your body and mind just won’t let you fall asleep or stay asleep all night long? Is there anything you can do about it? YES! Our system likes routine and predictability. Going to bed and getting up at the same time – even during the weekend – is vitally important. It’s the only way to get in sync with your body’s natural sleep-wake cycle (circadian rhythm). Consistency is crucial. And if you need an alarm clock, it’s a good indicator you need to go to bed earlier. You should wake up naturally without an alarm. Altering your schedule by even 1 hour can throw you off, so if you need to make changes, do it slowly in 15 minute increments over the span of a week. If you need to make up for a late night, opt for a 15-20-minute daytime nap rather than sleeping in. This pays off your sleep debt without disturbing your natural sleep-wake rhythm. Why not use an App like Sleep Cycle to track your sleep patterns and see what’s really going on. It even has an alarm to wake you up at the top of your sleep cycle, so you’re feeling refreshed. That’s so much better than being startled out of a deep sleep by your alarm clock. Sleeping difficulty is a symptom of an imbalance. Although sometimes it is a symptom of organic problems, more often than not it is an indication of poor habits. One of the biggest culprits that hinders restorative sleep is not getting enough sunlight at the right time and getting too much artificial light at the wrong time. Melatonin, a naturally occurring hormone, is controlled by light exposure that helps regulate your sleep-wake cycle. Your brain releases more melatonin causing sleepiness when it’s dark and less when it’s light causing wakefulness. When the sun is up, take advantage of it! Expose yourself to sunlight upon waking up. Look out a sunny window, take your coffee outside, get dressed and go for a walk. Anything to get some sun. Spend more time outside. Take your work breaks outside in sunlight. Exercise outside or at least during the daylight hours. Let as much natural light into your home or workspace as possible. If necessary, use a light therapy box. This simulates sunshine and can be especially useful during the short, rainy, winter days we have in Oregon. When the sun goes down, start winding down your day. Of course, during the shorter days of winter, that’s not practical. You’ll have to rely on indoor lighting to extend your day. Just remember that the light emitted from your phone, tablet, computer, or TV is disruptive to your circadian cycle. So, try to avoid these screens two hours before bedtime and replace them with relaxing activities such as music, reading a “real” paper book, listening to audio books, meditating, planning the next day, and talking with friends. It’s also helpful to use a dim nightlight in the hallway or bathroom for any nighttime trips. And make sure your bedroom is darkened. Even cover your clock, if it emits light. One other thing – with all the “health” fads people try, it’s important to note that we need protein and good fat (i.e. grass-fed butter, coconut oil, MCT oil) at dinner. Your body needs it for repairing your muscles and immune system overnight. If you have trouble digesting proteins at night, use enzymes to make them more digestible. Restorative sleep is one of the most important healing practices and needs to be cultivated, supported and made a priority in order to cultivate wellness. Are you tired of being tired? Does something feel out of alignment in your life but you just can’t put your finger on what it is? Contact me about one-on-one coaching options that will help you enhance your wellbeing so you can wake up excited about each new day! Sleep is just one indicator of your wellness. There are seven we all need to be mindful of. 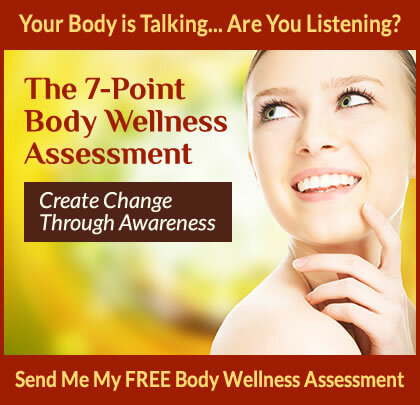 If you haven’t taken the 7-Point Body Wellness Assessment yet, please do so right now. Click here to download your free copy. Learn more sleeping tips here.